ValeGuard has an attractive and compelling gameplay loop – during the day, you’ll build up your town’s defenses, train soldiers, and create pathways to defend during the night, when you’ll be attacked by monsters. There’s a pleasing combination of real-time strategy and hero management that shows a smart economy of design. There are tons of great indie games, and we’ve collected our favorites into this list of our favorite PC indies. But what might be most interesting about the game is that ValeGuard has been developed by one person, Ryan Drag, and that he hasn’t written a single line of code for it. Instead, he’s used a piece of software called Playmaker, a plugin for Unity that allows developers to create scripts and gameplay behaviors in a visual interface, handling the arcane details of coding under the hood. Playmaker has allowed Drag to create a feature-complete game using his own art assets and ideas. 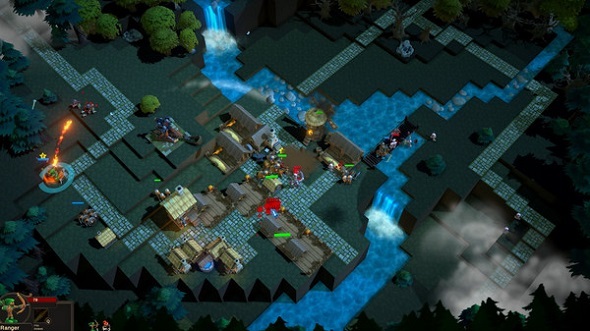 ValeGuard has a blocky Minecraft-style look and it procedurally creates new worlds for each playthrough. When you realize that no coding was required to make it, the details start really popping out – enemy and friendly AI all work, and the towns the game generates are all unique, playable spaces. It’s a great example of the democratization of game creation tools over the past several years, but it’s also a fun tactics experience. ValeGuard launches in Steam’s Early Access May 11, and you can check out its page here, or find out more on the ValeGuard IndieDB page.